Joseph and Grace Wild(e) Wrigley are my 2nd Great Grandparents. Joseph Wrigley was born on Tuesday, January 12, 1836, in Salford, Lancashire, England. His parents are my personal brick wall. I have ordered Joseph’s birth certificate to see if I can start to confirm the identities of his parents. Joseph was baptized in Heywood on February 21, 1836. Joseph married Grace Wild in 1861 in Bury, Lancashire England. Grace Wilde was born on Saturday, March 30, 1839, in England. She was the daughter of Joseph Wilde and Martha Horsfield. Grace was christened in Heywood on October 27, 1844. Joseph and Grace had two sons while living in England. (1) Joseph (born January 26, 1865), and James (born April 11, 1868). Joseph and family arrived in the United States sometime between 1869 and 1870. In 1870, Joseph was living with his wife Grace Wild Wrigley, and their two sons, Joseph and James, in Springfield Township, Delaware County, Pennsylvania. Joseph worked at an Ax Mill, which was most likely Beatty’s Axe Factory, which was located in that township. On September 24, 1870, Joseph and Grace had a daughter, Martha Ellen. On January 6, 1873, Joseph and Grace had another son, John C. Wrigley. On June 23, 1879, they had another son named Frederick. 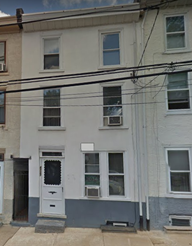 On In 1880 Joseph Wrigley was living at 4742 Washington Street (now called Umbria Street), Philadelphia, Pennsylvania, United States, along with Grace, their sons Joseph, James, John and Frederick as well as their daughter Martha. Joseph and sons, Joseph and James are listed in the 1880 census as working in a cotton mill. After the 1880 census was taken, Joseph and Grace’s son, Frederick (Fredie), died from Diptheria on June 20, 1880. The death notice for Fredie indicates that they possibly lost two other children, either in childbirth or shortly thereafter. This could have been prior to sons Joseph and James birth, based on the time between Joseph and Grace’s marriage, and the birth of their first son, Joseph. On March 3, 1888, Joseph and Grace had one more son, William. Understanding the fire of 1921 and the subsequent 1935 destruction of most of the 1890 census information, we jump to the year 1900, where Joseph and his family are found to be living on or near 4853 Washington Street (now Umbria). They were living next door or near Martha’s home. His occupation is listed as a blanket weaver. His sons John and William were living there, and John was working as a blanket weaver, and William, a cloth finisher. By this time, son Joseph was married to Isabella Beatty (married in 1892). James was married to Katherine McMonegal (married on June 5, 1895). 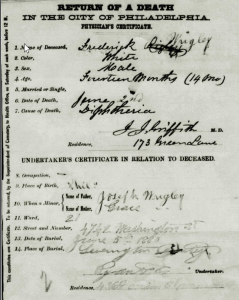 In 1905, it appears that Joseph was living at 4810 Ogle Street in Manayunk, and on June 29, 1905, he died and was buried at Leverington Cemetery on June 30, 1905. While records from Leverington indicate their burial plot and location, there is currently no gravestone for either Joseph or his wife, Grace. 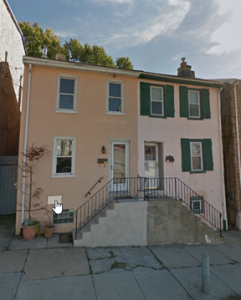 In 1910, Grace was living at 153 Fountain Street in Manayunk, Philadelphia, PA with her sons, John and William. Census information shows Grace as the head of household, with no employment, John was working as a weaver in a woolen mill, and William was a laborer in the iron works. While John was actively working at the time of the census, it appears William was not actively at work. By 1920, Grace was living with John at 4727 Smick Street in Manayunk, Philadelphia, PA. William was then married to Elsie Smith Wrigley. As their first child was born in 1912, their marriage date would be assumed between 1910 and 1912. 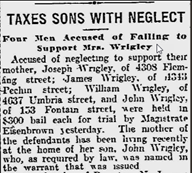 There was a newspaper article at around this same time that shows Grace had filed a warrant against her sons for neglect. Even though she was living with John, she was required by law to include him in the charges. On February 13, 1927, Grace Wilde Wrigley died at Memorial Hospital in Philadelphia from Bronchial Pneumonia after suffering extensive contusions following a fall. She was buried in Leverington Cemetery. Database online. Record for Joseph Wrigley. Ancestry.com, 1900 United States Federal Census (Online publication – Provo, UT, USA: The Generations Network, Inc., 2004.Original data – United States of America, Bureau of the Census. Twelfth Census of the United States, 1900. Washington, D.C.: National Archives and Records Administration, 1900. T623. ), Ancestry.com, http://www.Ancestry.com, Year: 1900; Census Place: Philadelphia Ward 21, Philadelphia, Pennsylvania; Roll: ; Page: ; Enumeration District:. Ancestry.com, 1910 United States Federal Census (Online publication – Provo, UT, USA: The Generations Network, Inc., 2006. For details on the contents of the film numbers, visit the following NARA web page: NARA.Original data – United States of America, Bureau of the Census. Thirteenth Census of the Unit), Ancestry.com, http://www.Ancestry.com, Year: 1910; Census Place: Philadelphia Ward 21, Philadelphia, Pennsylvania; Roll: ; Page: ; Enumeration District: ; Image:. Ancestry.com, 1920 United States Federal Census (Online publication – Provo, UT, USA: The Generations Network, Inc., 2005. For details on the contents of the film numbers, visit the following NARA web page: NARA. Note: Enumeration Districts 819-839 on roll 323 (Chicago City.Original data – United States), Ancestry.com, http://www.Ancestry.com, Year: 1920; Census Place: Philadelphia Ward 21, Philadelphia, Pennsylvania; Roll: T625_1617; Page: 1B; Enumeration District: 518; Image: 983. 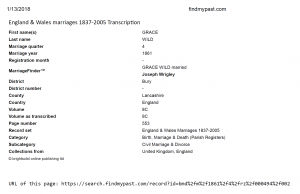 FamilySearch.org, FamilySearch Family Tree, FamilySearch, “Family Tree,” database, FamilySearch (http://familysearch.org : modified 12 May 2016, 01:49), entry for Grace Wild(PID https://familysearch.org/ark:/61903/4:1:9WL7-JPK); contributed by various users. PersonID 9WL7-JPK. 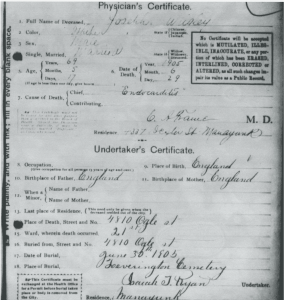 Ancestry.com, Philadelphia, Pennsylvania, Death Certificates Index, 1803-1915 (Online publication – Provo, UT, USA: Ancestry.com Operations, Inc., 2011.Original data – “Pennsylvania, Philadelphia City Death Certificates, 1803–1915.” Index. FamilySearch, Salt Lake City, Utah, 2008, 2010. From originals housed at the Philadelphia City ), Ancestry.com, http://www.Ancestry.com. Ancestry.com, U.S., Find A Grave Index, 1600s-Current (Provo, UT, USA, Ancestry.com Operations, Inc., 2012), Ancestry.com, http://www.Ancestry.com. 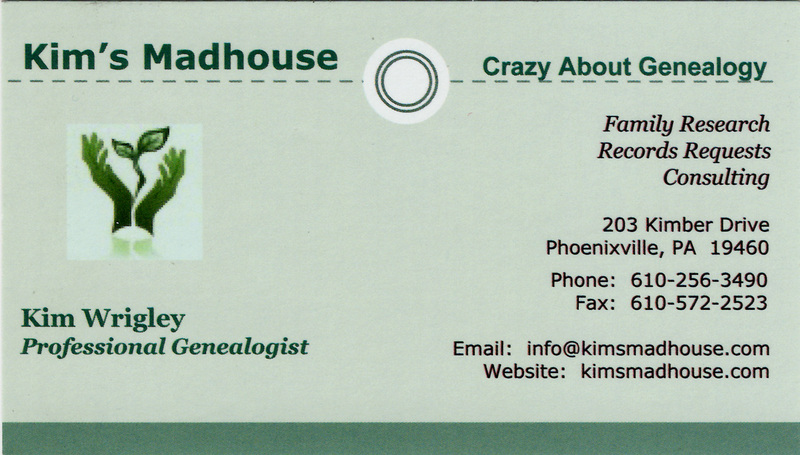 Ancestry.com, U.S., Find A Grave Index, 1700s-Current (Provo, UT, USA, Ancestry.com Operations, Inc., 2012), Ancestry.com, http://www.Ancestry.com. Ancestry.com, U.S., Social Security Applications and Claims Index, 1936-2007 (Provo, UT, USA, Ancestry.com Operations, Inc., 2015), Ancestry.com, http://www.Ancestry.com.